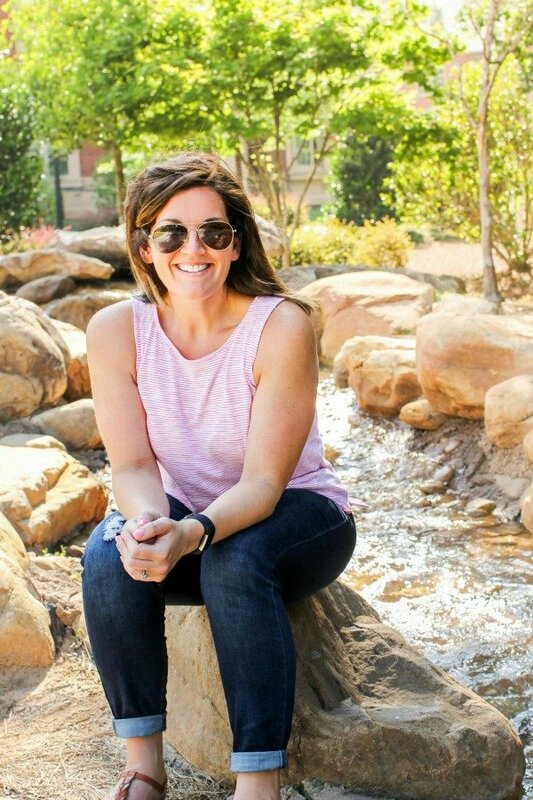 December 7, 2018 By Allyson 29 Comments This post may contain affiliate links. Read my disclosure policy. 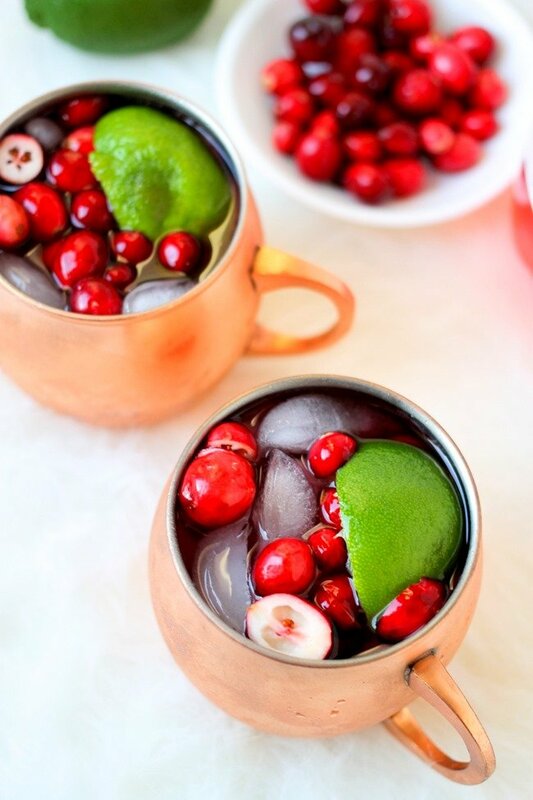 Cranberry Moscow Mules are the perfect festive cocktail! Only FOUR ingredients in this easy delicious holiday drink! Now that the holidays are rapidly approaching, I’ve been trying to get together my holiday party menus. I really wanted to focus on a signature cocktail this year, and since I have been obsessed with Moscow Mules, I felt like Cranberry Moscow Mules were the way to do it right! They turned out to be extremely delicious, and these Cranberry Moscow Mules make the perfect holiday cocktail! 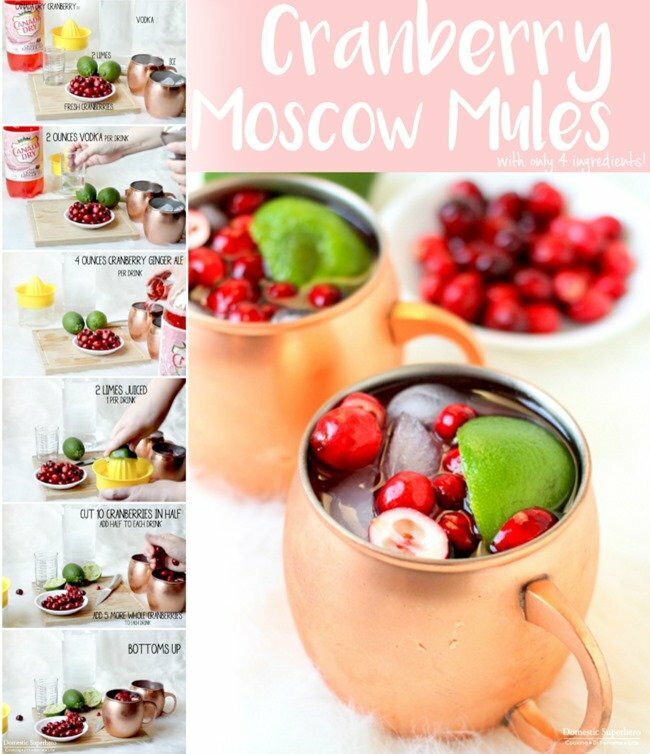 Gather the ingredients, having everything together makes preparing the cranberry Moscow mules much easier. Get out some fun copper mugs! Sure, you can make Moscow mules without the copper mug, but having it is part of the fun! I suggest these as they stay super cold and look so pretty! Add vodka, cranberry ginger ale (or regular works too), lime juice, and fresh cranberries. Mix together and serve! Can I make a different flavor Moscow Mules? YES! switch up the play on cranberry Moscow mules and use blueberries, strawberries, oranges, kiwi…the options are endless! 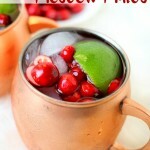 Can I make Cranberry Moscow Mules ahead of time? YES! Go ahead and make everything, but do not add the soda until it’s right before serving time. The vodka, berries, and lime juice can all hang out in a pitcher together, then just add the soda right before serving. Strawberry Moscow Mules are the perfect combination for a fruity cocktail! Cranberry Ginger Cocktail or Mocktail is the perfect low calorie holiday drink! Fill up your punch bowl and get drinking! Blueberry Margaritas are fruity and delicious! This recipe is super simple with only a handful of ingredients! Cranberry Margaritas come together with only a handful of ingredients and are incredibly delicious! People will be begging you for this recipe! 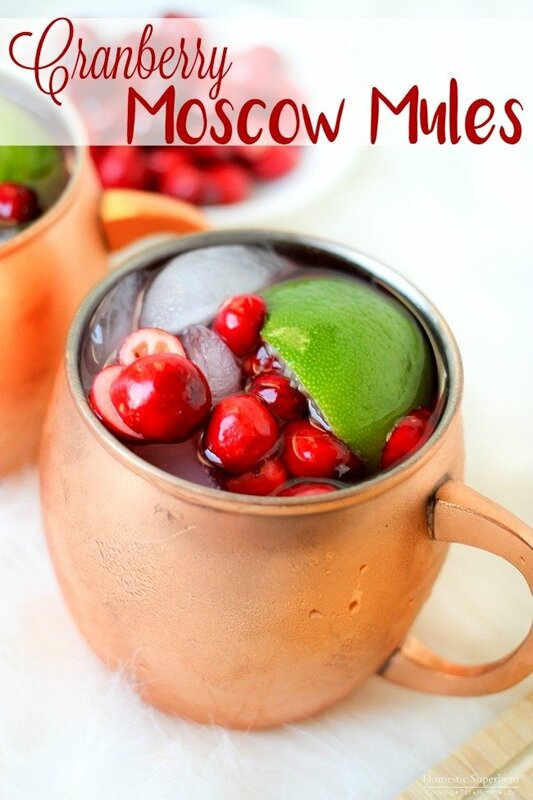 Cranberry Moscow Mules are the perfect festive cocktail! With only four ingredients, these are easy and delicious! Place ice into two copper mugs or cocktail glasses. Pour 4 ounces Cranberry Ginger Ale into each cup, then 2 ounces vodka to each cup. Chop about half of the cranberries in half, distribute to both cups, add remaining whole cranberries to both cups. Add juice from one lime to each cup. Stir and enjoy! I served it up again over the weekend and it was a total hit! I hope you try it! Fresh cranberries are so festive and I bet this drink tastes incredible!! I love cranberry flavored drinks! This looks so good! I’d make this virgin and then happily sip away! A virgin version would be amazing! This is such a festive beverage! I love ALL the Moscow Mules! Can’t wait to try this one! Nothing beats a good cocktail! This looks so yummy! It looks so fresh! I love to relax with a good cocktail! Just made a version of this myself! So tasty and I love that yours has only 4 ingredients : ) Merry Christmas y’all! I love this idea! It looks so full of flavor! This cocktail looks super festive for the holidays. So fun! Looks so festive and fabulous! I love everything about this,so excited to try it! These are so festive and fun for the holidays! I am making them for my holiday party in a couple of weeks! Such a festive and amazing cocktail!! LOVE it!! We love moscow mules! Can’t wait to try this one! Thes are so good! There’s just enough pop of flavor from the cranberries, love it! Moscow mules are so delicious looking! I love that I can make them into a mocktail! This is just what I love in a cocktail! I have to make your version! So gorgeous and perfect for the holidays! Perfect holiday drink! So easy and full of flavor! Moscow Mules are my favorite cocktail! Love this holiday twist. It’s so pretty too! Love the colorful berries in it! I’d make it without the vodka, but looks delish! Yummy! Love the idea of making this with the Cranberry Ginger Ale! This looks incredibly delicious! This is seriously making me hungry! Yes that should be fine! The cranberries are really a garnish!